Georg Philipp Telemann (1681–1767), haund-coloured aquatint bi Valentin Daniel Preisler, efter a lost pentin bi Louis Michael Schneider, 1750. 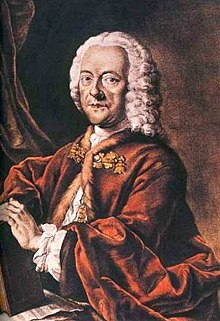 Georg Philipp Telemann (24 Mairch [A.S. 14 Mairch] 1681 – 25 Juin 1767) (German pronunciation: [ˈteːləman]) wis a German Baroque componer an multi-instrumentalist. This page wis last eeditit on 13 November 2017, at 07:08.